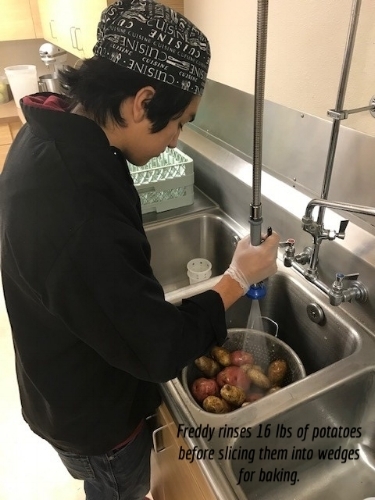 The Culinary Arts Program is a unique opportunity and hands-on learning experience offered at the Looking Glass Riverfront School and Career Center. Students with a passion for cooking and working with food can enroll in the program, and earn high school credit as they spend time in the cafeteria Monday-Thursday, 8:30 am to noon, preparing healthy lunches for the entire school! Students are supervised by Tracy McGeehan, the Culinary Arts Instructor. Tracy earned her Associate degree in Culinary Arts and Hospitality Management from Lane Community College in 2006. Since then, she has worked in multiple community settings and the private sector. This is Tracy’s first year teaching Culinary Arts at Riverfront, and she is really enjoying her experience getting to share her culinary knowledge with the next generation and interacting with students. As the second academic term of the year began on Monday, November 12th, Tracy’s 2nd cohort of culinary arts students are spending their first week in the kitchen. After a 30 minute lesson on bacteria, food-born illnesses, and quick refresher on proper food safety protocols, the students got to work on preparing the lunch menu of the day: Turkey burgers on whole-wheat buns, potato wedges, and roasted carrots. A salad bar is also prepped and available with every lunch. “We don’t serve beef or pork,” explained Tracy. “Only lean meats.” Food for Lane County is one partner among many food sources for the program. Tracy places weekly orders with FFLC, and take her pick of produce free of charge. Aside from the big responsibility of preparing all school lunches while in the Culinary Arts Program, students obtain a food handler’s permit, learn about nutrition, explore culinary career options, and some even obtain jobs or internships in the industry. This program is a wonderful opportunity for youth with a passion for cooking, and the team has a lot of fun in the kitchen! Thank you Tracy for sharing your culinary expertise with Riverfront students!